I grew up at a time when power was a synonym for energy and strength, not dominance. It had to do with having, giving, and taking strength; academic, mental, and moral from someone who had it in greater measure than oneself. I grew as a teacher in a time when the meaning of power took on the hues of authority, of control and of being in charge. Nothing wrong here, except that it brought complications into relationships and interaction. Semantics apart, power can be exercised, felt, used, misused, and over-used in every walk of life. Rewind to a time, in India, not so long ago, when almost every teacher was empowered by state, society, religion, parents and students to teach, to mould, to nurture, and dole out what wisdom she had accrued in her experience and education. Guru was next, after God. Submit, accept, and revere was the simple code which defined the teacher-student relationship. Fast forward to the present, where the students are in the classroom not only by privilege and duty, but also by right. The point I make here is that a learned teacher is still a valued teacher, but his job is to see that children or learners go from step to step up the school ladder, after which they are pushed out into the precarious business of living. Living in a world of greater complexity than ever before, how much more magnified is a teacher’s task and role! In the current scenario, children lead very complicated and complex lives. Too early, their problems at home and at school make children clamour for attention, in their need for recognition and reassurance that they matter. The teacher’s profile has changed too. She has more to cope with, to be responsible for, and to struggle with. This is not to deny that teaching can and must still be a vocation that is a noble process of giving children what she knows and what they need in terms of learning and living. She must stay focused on the outcomes of her teaching, demonstrating and handling situations that are complex and draining on her emotional energy. She must also keep learning! Classroom management has happily replaced the term “class discipline” in many progressive educational environments. Posing bigger challenges today than in the past, most experts agree it is a timely acceptance that it is not just status quo a teacher requires in her classroom, but a set of coping mechanisms that include her learners’ cooperation and not just compliance. Disruption is not the only problem that good classroom management deals with. A teacher’s responsibilities extend far beyond the classroom, where she doles out gems of knowledge and facts, which she herself is regurgitating from the textbook! It is as big as shaping her learners for life and for self-actualization, theirs and her own. Let me shift from the passive classroom to the overall change in attitudes between teacher and student. We now speak of a “responsive” classroom where teacher and student are learners together. The teacher, no longer “a sage on the stage” has to use democratic principles in a classroom. There is a set of social skills children need in order to be successful academically and socially: cooperation, assertion, responsibility, empathy, and self-control. Knowing the children we teach individually, culturally, and developmentally is as important as knowing the content we teach. All teachers know that there are “difficult” students in each class. They carry emotional baggage which manifests itself in anti-social, challenging, and uncooperative behaviour towards classmates, teachers and the establishment in general. Teasing, tattling and defiance complete the scenario. If ignored or challenged, such students become packages of resentment, resistance, and rebellion. Alongside, they become a teacher’s nemesis and can undo much of what she is building in her class and herself. The power struggle, once it is out in the open, takes very little to escalate into a “situation” which severely eats into a teacher’s morale. Moreover, schools, not unlike the corporate world, have become breeding grounds for power struggle. There are two options at this point. One is an approach in which the teacher confronts the situation and the other is to challenge it. Either approach brings change. Each class has its “terrorist”, one, or some, who will distract, disturb or provoke his or her classmates and/or the teacher on some pretext or other. 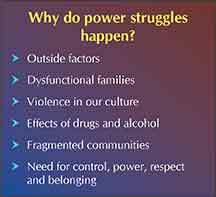 The power they want compensates for a low self-image that is the result of the way things are at home, arising out of neglect, abuse, or negativity. This fear and awe that their attitude engenders in class makes them feel good about themselves as a strong, to-be-feared leader in the eyes of the class, sometimes beyond the class as well. Then there are the gangs of bullies who hold other children to ransom and terrorize them on a regular basis. They get away with a lot, which the teacher or school might choose to ignore for a variety of reasons. It is wise to see this as a desire to feel significant or important and un-ignorable. Sadly, too few teachers see this as their problem and their responsibility and so the struggle takes an established pattern. Disruption, belligerence, and stubborn disrespect. Hitherto, teachers have too easily resorted to protection of “the Code of Conduct” which schools apply, whether written or unwritten. These are full of consequences for a list of unacceptable behaviours. However this does not guarantee change or reform in anyone’s behaviour or attitude, neither that of the student nor the teacher! It stems after all, from a teacher’s similar need to be significant and prove herself closer to the powers that be! The school’s Code of Conduct lists logical consequences to unacceptable behaviour, which are actually punishments in disguise. In the end, it must be realized that no one wins a power struggle. I would say that walking with defiant, disruptive, and disrespectful students in a way that recognizes and honours their need to feel recognized, if not importance in the class, slowly but surely builds rapprochement, respect, and even acceptance. This can be done in small ways that take the focus away from their negative, disruptive, or even dangerous attributes. Children whose need to get the better of a teacher stems sometimes from the need to be able to speak frankly and forthrightly to their teachers. This can never be done in front of the class where it is vital for the gutsy hero to be seen to stand his ground. Rather it can be done in a one-to-one situation, away from prying eyes or ears. If this approach seems a distant dream, a teacher must slow down, reflect and tackle a situation with utmost tact and a receptive frame of mind. In fact, she must apply the opposite behaviour of pushing the student/child’s buttons more strongly with each new misdemeanor. Sometimes she must just disengage, making it clear by body language that it’s not over. The teacher has given the student and herself time and space, literally and emotionally. She can come back when both offender and offended are in a more rational frame of mind, a better climate to talk; negotiate and attempt a win-win solution to the problem, attitude or behaviour set. This is not to compromise or condone, but to seek and to find. Better understanding. Positive attitudes all around. Turning negative leaders into positive ones takes time, patience, and constant introspection on the part of the teacher. Constructive opportunities to feel productive will demonstrate that erstwhile disruptive students can change, that gangs and bullies are “normal” people too. The positive teacher, chastened of her earlier reactive responses, will be the recipient of compliance, respect, and cooperation. Lots of empathy, great stores of tact, neutral body language, and redirection win the day, in a power struggle. It’s as simple or as complicated as that! The social curriculum is as important as the academic curriculum. What children learn is as important as how they learn: process and content go hand in hand. The greatest cognitive growth occurs through social interaction. How the adults at school work together is as important as individual competence: lasting change begins with the adult community. Trips to the principal’s office, detention, frequent complaints to parents are band-aids, not solutions. A classroom/campus with boundaries of discipline and rules is a must. But so is a teacher’s willingness to make investments in recalcitrant students, believing in her own power to transform, so that such students feel safe. When we feel safe, and un-condemned, we are willing to listen and thus able to learn and consciously change our attitudes and behaviours. A collaborative will to treat problem students and unacceptable attitudes is needed. Persuasion rather than regulation, consistency in the teacher’s efforts, less use of positional power by principal and teacher will surely yield results. It will earn the teacher much mileage in terms of credibility, respect of the class and community and provide for students a rehearsal for life situations. A teacher must never look for victory in the humiliation of a student. Detention and expulsions have become passé in an increasing number of schools. It is human to dominate, but also very human to want to feel empowered. Somewhere in between lies the answer to recovery of respect and harmony in the classroom and out of it. The author is a teacher/principal/teacher trainer for over four decades. She enjoys interacting and working with energetic, progressive and empathetic teachers. She considers it both a privilege and a duty to be part of the changing scenario of education in India. She can be reached at pritambenjamin@hotmail.com.